Before our babies can swim, they hear the call of the awa. Ko au te awa, ko te awa ko au. Their whakapapa aligns them to te awa tupua; the heart beat that pulses from Taumarunui to Putiki; the Whanganui River. They know the people and the river are one; the awa is the sanctuary for healing; the site of cleansing, to pray, to purify, to play, to swim; to be immersed in the swirling rapids, the deep pools of wonder. And so it is with a mixture of fascination and awe that this week I stood on the banks of the mighty Wairau and marvelled at the diverse colours and depth of its waters. The Wairau is a large braided river and is the largest river in Marlborough. It starts in the high alpine ranges between the Spenser Mountains and the St Arnaud range and flows for a massive 257km from source to sea. This beautiful awa is also a great reminder of the connections and relationships that flow between iwi. In a settlement framework, the length and strength of the Wairau River brings with it shared customary rights which often overlap and intersect with the iwi who call Wairau home. To this end, when we think of the origins of the name for the Whānau Ora Commissioning Agency in Te Waipounamu the connection to the multiple rivers that run through rohe is perfectly placed. Te Pūtahitanga o Te Waipounamu : the multitude of rivers that we link into across the South Island. In my river hikoi this week my first stop was to visit Rangitane o Wairau. Rangitane o Wairau have occupied and used resources within a territory stretching from the Waiau-toa (Clarence) River in the south to the Wairau (Marlborough), including the Nelson Lakes, and north to Kaituna and the Marlborough Sounds and west into the Whakatu (Nelson) area. It was wonderful to meet with Sarah Lee and Nick Chin at the Rangitane o Wairau headquarters. There is so much productivity and positivity happening within the iwi offices I visited this week. Rangitane o Wairau had just completed their AGM in the weekend, and were buoyed by the announcement that they had made it through to be finalists in the 15th Ngā Tohu Reo Māori, the National Māori Language Awards occurring at Te Papa Tongarewa on Friday night. Fush, a whānau enterprise in Otautahi, have also been announced in the finalist line-up. FUSH share a passion for normalising te reo Māori within the workplace and showing young rangatahi the value of hospitality and generosity, particularly within te ao Māori. After Rangitane o Wairau I spent time with Olivia Hall, the Chairperson for Te Runanga o Ngati Rarua. Olivia shared with me some of the great results recorded in their annual report - I was taken with their novel mesh carrybags which also contained a message around environmental responsibility – reuse, recycle, restore. 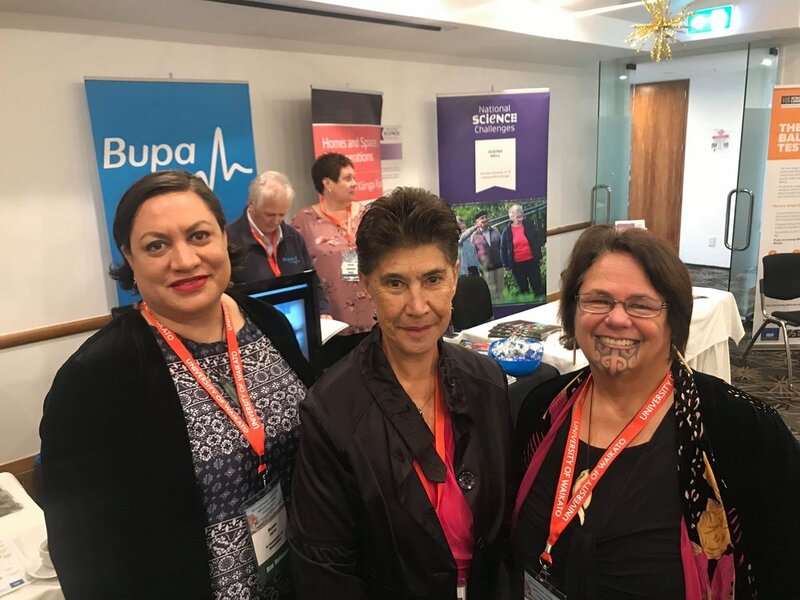 Earlier in the week, my Commissioning Manager, Maania Farrar had also spent time in the company of the hauora provider for Ngati Rarua, pictured here with Sandra Evers and Whaea Molly Luke. From Ngati Rarua, I travelled to the offices of Ngati Apa ki te Ra To where the ever dynamic Kiley Nepia presented me with my own copy of ‘Apa ki te Ao’. Ngāti Apa ki te Rā Tō has launched a new cultural resource kit to help connect whanāu with Te Ao Māori, starting with the basics. The new multi-media learning kit introduced members to their pepeha, waiata unique to the tribe, and karakia. That’s the way, the Apa way. Ngati Apa is all a buzz preparing for Te Ipukarea 2018; tomorrow (Saturday 24th). Tomorrow will be their turn to host Te Tauihu o te Waka o Māui manawhenua iwi, Ngāti Kuia, Rangitāne o Wairau, Ngāti Koata, Ngāti Toa Rangatira, Ngāti Rārua, Ngāti Tama, and Te Ātiawa, to be part of Te Ipukarea, Inter-Iwi sports day. The games this year will be netball, touch rugby, and Ki o Rahi. Iwi may enter a maximum of two teams per sport/grade. After a very stimulating day in Blenheim I travelled through Ngati Kuia land, stopping for a while to reflect in the beauty at Titiraukawa. As a child we had enchanted holidays camping in Te Hoiere – the Pelorus area. The jewel-green waters are mesmerising – I have spent many an hour refreshing the soul in this beautiful place. And then on to Nelson, where I finished my day with visits to Ngati Tama ki te Waipounamu and Ngati Koata, catching up on the news and developments for each iwi in respect of their whānau; their vision and purpose; and current priorities coming through from their membership. Last weekend in Nelson, the Saxton Oval Pavilion was packed with enthusiastic entrepreneurs and Whānau Ora enterprise leaders, at the Nelson Regional Māori Business Forum. Our intrepid selfie-star, Maania, shared a moment capturing the energy at that forum. It was great to see a bit of a South Island reunion happening at the 2018 National Kaumātua Service Providers Conference held in New Plymouth. The theme of this conference – together we can achieve more – was one which speaks to collaboration across the social services sector; collaboration within and between whānau entities; and ultimately throughout all our whānau groupings. Our elders are kaiarahi for their mokopuna. As leaders for their descendants, they provide guidance and support through their words and deeds. We must work together with them; seek advice and counsel from them’ and not think we have to do for and on their behalf. We were delighted to support Maania in her presentation to the national conference, in sharing some of the amazing developments whānau are advancing across Te Waipounamu : Ties That Bind us; kaumātua ukulele roopu; Kaumatua specialist navigator; maara kai; Kaumatua Healthy day at the pa. This week our team has been part of consultations occurring at Rehua Marae and at Manawa (health sector) where the Department of Prime Minister and Cabinet came to provide an overview and update on the Child Poverty Reduction Bill and planned Child and Youth Wellbeing Strategy. The purpose of the hui was to seek input and feedback on the draft wellbeing outcomes framework and sixteen proposed areas of focus for the Strategy. While it is positive to focus on child wellbeing, my view is that it would be more constructive and useful to think about whānau wellbeing (which by its nature is inclusive of children). For the last thirty years we have had a priority and preference for a “child-centred approach” as evidenced by setting up the Office of the Children’s Commission; the 1989 Child, Young Persons and their families act; the UN Declaration on the Rights of the Child, and other government policy initiatives. We might talk about ‘child poverty’ but no child ever grows in isolation of the whānau around it. If we are address inadequate income, we must take account of the needs of the whānau – employment, housing, food, basic essentials. Another issue that I was keen to raise to their attention was the importance of including wairuatanga or spirituality when we are talking about child and whānau wellbeing. The feedback from the floor at Rehua was animated and energetic. Whānau talked about the need for predictability : knowing a kai would be on the table; that care would be continuous. Taua Aroha implored the Prime Minister to meet with the Māori Women’s Welfare League; Aunty Kiwa raised the importance of supporting fathers to be great Dads; Justice Arahanga talked about the value of youth mental health. It was an afternoon of rich korero that I am sure will greatly enhance the ongoing strategy. The Government is investing $15.379 million from Budget 2018 into new ‘Whānau Resilience’ long-term healing and recovery services from July 2019. Whānau Resilience services will be designed to enable family violence service providers to offer long-term healing and recovery services to individuals, families, whānau and communities affected by family violence. Whānau Resilience services will be nationally procured and regionally designed. This approach recognises that communities and providers have invaluable knowledge and experience that should inform the design of services available in their communities. On Monday, 19 November, a Working Group National Hui was held regarding the “Mothers with Babies Units – National Operating Model for the Department of Corrections. The general view from the hui was that the pathway to a solutions-based model lay within the notion of “Maori Management of Maori Matters in a Maori Way”. The group discussed both long term “outside the gate” strategies to issues of immediate concern “inside the gate”. The hui was informed and influenced by the voices of Māori mothers who had their babies while incarcerated. One mother considered her child was “not a criminal” implying that her baby ought to not be raised inside the gate. She relayed that it was great seeing her baby whilst she was incarcerated but she wondered how she was going to explain to her baby that he had spent the first year of his life in “prison” and what the impact of that stigma might be in later years. Maire Kipa and I were grateful to be part of such an important discussion. The hui was brilliantly facilitated by Maraea Teepa from Oranga Tamariki. Finally, a wonderful way to end the week with the wisdom of our Whānau Enterprise Coaches as they prepare to support our Wave Eight entities with the rollout of their initiatives. Te Pātaka o Wairau Night Market is back on Thursday 5 February 2019, from 4-8pm at Seymour Square, Blenheim! Under the korowai of Rangitane o Wairau, Ngati Rarua and Ngati Toa Rangatira we welcome you. With kapa haka performances and DJ Becs come along and celebrate whānau!